Whatever your horse is afraid of it, your general approach will be similar, so it’s good to know what to do! Firstly you need to recognize that your horse is feeling scared - this sounds obvious, but the early signs are quite subtle. Then you need a clear approach to resolving her fear. The early signs of tension, before the horse’s head comes up and she starts trying to escape or defend herself, are quite subtle, but easy to recognise once you know what you’re looking for. The lip line going straight - usually there is a little downward curve at the corner of the lips, this disappears as the horse becomes tense. The chin looking tight or ‘tucked’ - in a very relaxed horse, the lower lip loose, sometimes floppy and protruding, and the profile of the muzzle looks sort of square. As they become tense, the chin tightens and goes back a little, so the lower lip looks more tense, and the profile is not square any more, the chin slopes backwards from the upper lip. The look of the nostrils may also change - the ‘piping’ round the edge of the nostrils is round and soft looking when the horse is relaxed, but the edges will become long and thin when the horse is tense. In the picture on the left, the nostril edges are thin (you can see them clearly), the lip doesn’t curl down at the corner, and the chin is tucked back just a little - the early signs of tension. The more obvious signs, such as the head coming up, have not yet appeared. In comparison, in the picture on the right, the nostrils edges are soft, chin relaxed (see the bottom lip protrudes a little), and there is a clear downwards curl at the corner of the lips. Trainers, but it is helpful to know what the underlying processes are and the effects they have on your horse. This involves exposing the subject (be it human, horse or any other animal) to the source of their fear, with no option to get away from it, for the entire training session. This can be a very fast method, and is often used (although trainers sometimes don’t explain what they are doing!). Welfare - exposing the horse to fear and causing unnecessary stress. Safety - for the person and the horse - risking provoking extreme reactions in the horse is clearly unsafe! Practical reasons - the horse may succeed in escaping what it is afraid of, learning exactly the wrong thing. There are other reasons, such as the horse’s reduced ability to learn when scared and that they do not necessarily become comfortable with their source of fear, but only learn that resistance is useless, but if the first three don’t convince you this is a poor option, probably nothing will! There are a few situations where there is no option but to use this technique, such as a medical emergency where treatment has to be applied instantly and sedation is not possible. This is at the other end of the scale and, sometimes with minor modifications, would be my preferred option. 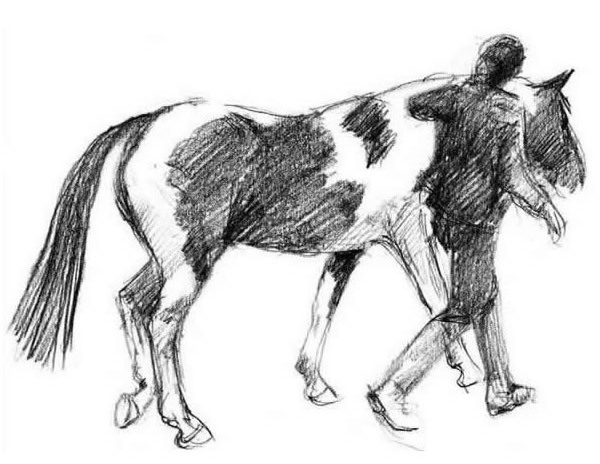 The exact stimulus causing the horse’s fear is identified and the horse is then exposed to a much reduced version of this stimulus, at a level where it only causes mild worry. For example, if the horse is scared of the sound of clippers, record the noise of the clippers, and play it at low volume for just one second so she is just a little worried. Repeat until the horse in no longer worried at all, then repeat some more! Then increase the volume, or lengthen the time the noise is played, and so on. This can take quite a long time, and you may need some help to identify exactly what your horse is scared of, and to put together an effective training plan to increase the stimulus at the right speed, but it is very safe, effective, kind to the horse, and provides a long lasting cure. Other proposed methods of dealing with fear, such as advance and retreat, basically use a combination of thesetechniques and have varying degrees of success. I would always go for the option which is safest, kindest to the horse, and most effective in the long term - systematic desensitisation.